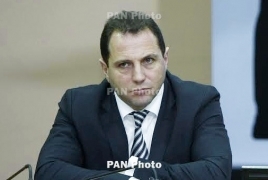 PanARMENIAN.Net - Armenia and Russia are negotiating a new military loan agreement worth $100 million, Defense Minister Davit Tonoyan told reporters on Wednesday, September 12, according to Aysor.am. Tonoyan was asked whether new arms deliveries from Russia and military contracts with Moscow are planned in the near future. “The process is underway, but I can’t disclose the types of weapons under the deals,” Tonoyan was quoted as saying. As reported earlier, the Armenian Armed Forces have received all the weapons and ammunition envisioned under a $200 loan agreement with Russia, signed in June 2015.